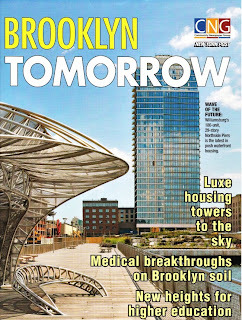 The first two issues of the annual Brooklyn Tomorrow supplement--essentially advertorial--highlighted the Atlantic Yards project on the cover and in advertising, but the 2009 version omits any mention of the project. 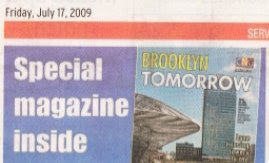 Brooklyn Tomorrow is published by the News Corporation's Community Newspapers Group (CNG) and was included in yesterday's New York Post and this weekend's Courier-Life --and, for the first time, the Brooklyn Paper, which entered the CNG fold in March. All the articles were written by Courier-Life staffers. Why omit Atlantic Yards? 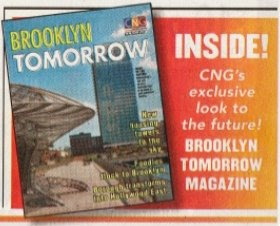 Surely it remains part of the CNG vision of Brooklyn Tomorrow. Perhaps Forest City Ratner didn't want to share images of the project, either because they're not ready, or the "hangar" of a new arena is too embarrassing. Maybe it's that there are no advertisements from Forest City Ratner, the Nets, or Barclays this time. Or maybe it's both. On the cover is a rendering of Northside Piers in Williamsburg, billed as the "latest in posh waterfront housing." The exponential pace of growth Brooklyn has enjoyed for the past several years may have slowed a tad, but it still whizzes by, and the future still seems bolder and brighter than anyone could have imagined, particularly in today's uncertain times. Buying into the borough's future never looked so good. Cost-cutting and an array of incentives at some of Brooklyn's toniest waterfront buildings oculd make luxe living the new black. Then again, New York magazine has a different view of The Billyburg Bust.